Well, it's been another fascinating day of domestic cricket. 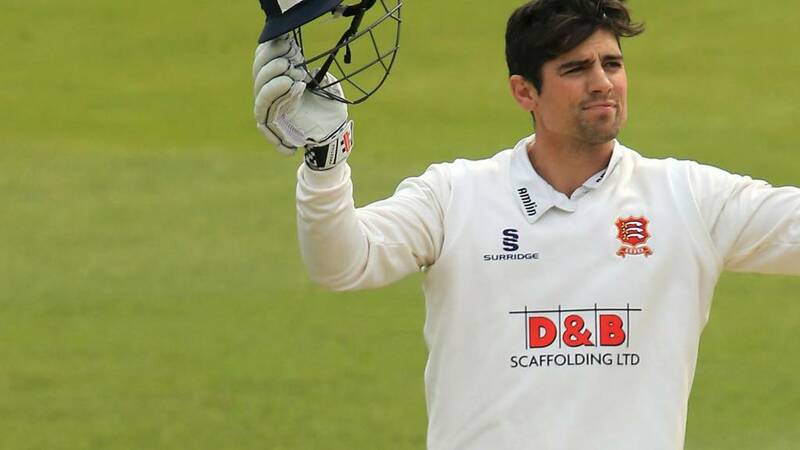 We've had a century for Alastair Cook, Northants' Ben Duckett piling up an unbeaten 282 and Durham opener Keaton Jennings scoring his second century of the match against Somerset. Join us on Tuesday from 10:55 BST for live radio and text commentary from the third day of the 2016 County Championship season. Enjoy your evening whatever you are up to! Here's how things stand after the second day of the 2016 County Championship season. And that brings day two of the 2016 domestic season to an end. He goes into the pavilion on 105 not out, while captain Paul Collingwood is 39 not out. Remarkable! Durham opener Keaton Jennings has his second century of the match. He brings it up with a four off Roelof van der Merwe. It came off 163 balls with 15 fours. He'll sleep well tonight I'm sure. Keaton Jennings is only dealing in singles at the moment. He moves to 96 not out. Three overs left at Chester-le-Street. If Keaton Jennings does reach three figures, he'll join an illustrious club of Durham batsmen to score two centuries in the same match. The 23-year-old is just seven runs away. Time for a Jennings ton? Durham opener Keaton Jennings is just 10 runs away from reaching his second hundred of the match. There are a minimum of eight overs left at Chester-le-Street - but the light is closing in. ...and here it is. Play is off for the day between Notts and Surrey. "To borrow a phrase from another activity, this was in so many respects a day of two halves. "Essex batted beautifully in ideal conditions in a busy morning session - during which the visitors' seamers bowled 33 overs - as Alastair Cook and Tom Westley played in their contrasting styles to reach 164 -1 at lunch. "They had put on 222 runs together before Cook was lbw to Jack Taylor's seventh delivery of the match for a typical 105, his 52nd first-class century and Westley went soon after for 121. "As the weather deteriorated, so did Essex's dominance and they finished in a useful, but not commanding, position 25 runs ahead with four wickets in hand." So, once again we've only got action between Durham and Somerset. Durham have just lost their fourth wicket - Michael Richardson was lbw to Lewis Gregory for nought. Skipper and former England batsman Paul Collingwood comes in at six. They're off again at Trent Bridge. Momentous moment in the north-east! The gloom is moving north. Jack Burnham is out at Chester-le-Street. However, Keaton Jennings is approaching his second hundred of the match. The opener is 72 not out. The umpires have also decided to call things off at Chelmsford. Gloucestershire produced a fine fightback in the afternoon taking 5-53 including Alastair Cook for 105 and Tom Westley for 121. We go again on Tuesday. Play has been called off for the day at Wantage Road. Ben Duckett will resume day three on 282 not out. Unless Northants declare overnight - seems unlikely though! Notts skipper Chris Read has indeed asked Surrey to bat again after conceding that first-innings deficit of 221. I've never been to Chester-le-Street - sounds like I would hear a few interesting things in the stands when I do eventually make it up there. Wicket at Chester-le-Street too - Scott Borthwick is dismissed by Tim Groenewald. Durham are still well on top though.